The classic "Are we there yet?" rang in my mind as we made our perilous ascent. My knees ached, sweat lined my hat, but I felt that this was the day. Days earlier, on September 1, 2010, with the Iowa sun was setting fast, I released my last practice arrow into the vitals of our bull elk target at 40 yards. The next morning my dad and I boarded a plane, bound for Unit 34, a premier elk unit in New Mexico. DAY 1: I woke up, looked at the clock: 4:23 a.m. After a quick shower and breakfast, I met up with friends and fellow elkaholics Ralph and Jay. We headed to a secret mountain that in past seasons had proved to be worth the effort to scale. The morning went fast as we covered two mountains. After brief encounters with cows and spikes, I had just sat down, tightened my shoe strings, and was eating some lunch when a screaming bull bugled. He was close and coming—the hunt was back on. Ralph set up and started cow calling. Jay and I moved up to see if the bull would come in. My heart pounded a little faster now. We advanced slowly, a few steps at a time until I spotted a tan-colored rump feeding away. It was a 5x5 with an impressive sun-bleached white rack. I suddenly caught movement out of the corner of my eye. Instantly I froze. To my right, less than 40 yards away, was a cow and her calf. They started feeding away from us, and the bull soon followed them. The bull was no longer stalkable or interested in Ralph's calls. Jay and I retraced our steps back to Ralph. We soon headed off to a new spot where we had earlier heard another bull bugle. Ralph bugled and a distant bull responded. Jay and I made our way toward the interested bull. Thirty minutes later, we came to a clearing and paused with the same thing on our mind—the wind was in our favor, and the bull was heading our way. We scurried across the clearing and gradually climbed up the other side of the canyon. Halfway up, I saw movement and the rump patch of an elk standing there, looking away. He bugled and the bushes around him seem to shake. He was less than a hundred yards away. I nocked my arrow and focused. We crept closer and closer. Soon, I could just make out a giant rack. Now 80 yards away, I counted my steps and kept looking ahead. 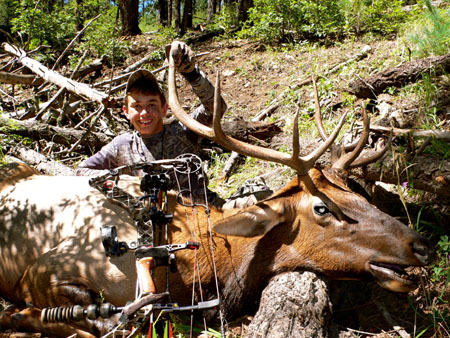 At 40 yards, the bull hadn’t moved. I drew, but the wind swirled. The bull glared in my direction and scampered off. DAY 2: The Hell Hole had a bad name, but a good reputation for producing some real nice bulls. You need to be half goat to get in and out of there. It is steep, jagged, and has deadfalls everywhere. About halfway up, "Are we there yet?" kept ringing in my mind. My knees ached, sweat lined my hat, and I knew that today was the day. We set up at the top where the elk bed. Ralph started calling. No response, so we moved to the other side of the mountain and glassed. After a couple minutes we spotted a small bull across the canyon, then a herd of five bulls walking down the mountain. We hauled over to where we had seen them, and Ralph started calling again. The curious younger bulls slowly trickled into our setup. Ralph continued, moving backwards to pull the bulls closer. Soon we had all the bulls in our lap. Problem was, the bushes were so tall, I couldn’t see over them. I could hear and smell the bulls, but had no good shot openings. Again the wind changed, and off they went. After a brief break and discussion, we followed a trail down along a saddle. Suddenly Ralph dropped to the ground. A group of bulls were on a collision course straight for us! Ralph threw a couple cow calls. I quickly set up. Ralph ranged one of the bulls at 43 yards. I drew and focused my pin. Thwack! My arrow hit true, the bull stumbled off a few yards, fell, got back up, then followed the other bulls down and across the saddle. Once everything calmed down we start looking for blood. Sure enough, it was dark red, probably from the liver. We waited an hour and a half before following the bloodtrail up the side of the canyon. The scrub oak bushes were so thick that we easily could have walked by him. After an hour, I start to lose hope. Jay, at the bottom of the canyon, only 85 yards away from me, was staring intensely through his binos into a spot I couldn't see. Then he looked and gestured to me. Slowly and as quietly as possible, I maneuvered down the hill a few yards from him. "I spotted your bull," he whispered. "He's bedded by a small drainage by a waterhole. I think we should just wait him out." Ralph said we should give him another hour, so we quietly backed out of the area. During that torturous hour, I wondered what had happened. My shot looked and felt good. After we made our way back, one slow step at a time, I nocked an arrow. Less than 30 yards away, slowly I moved over the knob for a peek. A hind hoof in the air was attached to a buckskin belly upturned on its side. I pulled my arrow off my string, turned around, smiled, and thanked God. What filled me was more than happiness—my first elk! The bull was a basic 5x4, but had a kicker, so I gave him credit as a 6x4! Later as we packed my bull out, I asked Ralph how many elk he had packed out. His reply: "Reed I am now one elk away from hauling 200 out of these mountains!" I was astonished. Who knew that a 6x4=199? Gotta love it!